Hadrian’s Wall Country stretches across the North of England from the west, Cumbrian Roman coastal defences at Ravenglass, through Whitehaven, Workington and Maryport to Bowness-on-Solway, along Hadrian’s Wall through Carlisle to Hexham in Northumberland and on to Newcastle upon Tyne, Wallsend and South Shields. 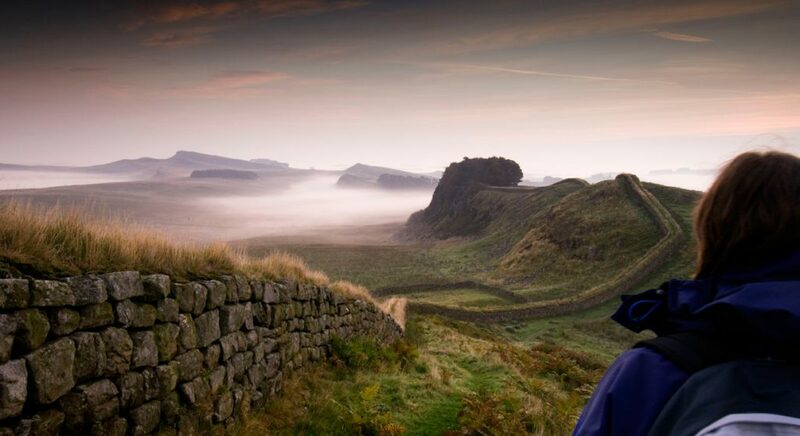 Hadrian’s Wall is a spectacular World Heritage Site, marching 73 miles from sea to sea across some of the wildest and most dramatic country in England. Unlike many other historic places, Hadrian’s Wall Country has something for everyone – world class archaeology, spectacular landscapes, rare wildlife, complete solitude, vibrant cities, wonderful pubs and a population of friendly and welcoming people. Hadrian’s Wall Country offers infinite opportunities for cherished memories and special moments. The sheer scale of the World Heritage Site combined with the four seasons, the living landscape and the people who live, work and visit here mean it is an ever changing canvas. It is where history is accessible to all, where adults and children learn and it is where the Romans are still part of everyday life 1,600 years after they left. Click here for the English Heritage Guide to The Housesteads Roman Trail and to see some of the points of interest, such as the Walltown Crags, Cawfields Roman Wall and Winshields Wall, as well as the Housesteads Roman Fort and Museum. Birdoswald’s historic landscape is dominated by remains of the Roman frontier, spanning across both counties from Northumberland into Cumbria. Picturesquely set by the River Irthing, it is the perfect location for a full day out for those eager to experience more turbulent Roman history, and benefits from this section having the longest continuous stretch of the wall as well as a Roman Fort and a priory made from stones found on Hadrian’s Wall. The entire 30 mile stretch of this western section of Hadrian’s Wall, from the River Irthing crossing at Harrow’s Scar to Bowness-on-the-Solway, was originally built of turf, and it was probably during Hadrian’s reign that this section of the wall begin to be rebuilt in stone, then the work continued when the wall was reoccupied in the 160’s. You will also come across The Lanercost Priory on the Birdoswald Trail. Now tranquil and in a beautiful setting, The Lanercost Priory carries a troubled history, suffering frequent attacks during the Anglo-Scottish wars as it stands so close to Hadrian’s Wall. If you do venture over to the Cumbrian site of the wall, you must visit some of the best-preserved monasteries where you will find an impressive noble 13th century church which survives to it’s full height, housing some of the finest monuments within it’s dramatic triple tier of arches. Stroll a mile north-east of Lanercost Priory and you will find the short stretch of Hadrian’s Wall which still stands at a massive 2.7 metres tall, which is one of the tallest sections of the wall. You can imagine how huge Hadrian’s Wall would have been when it was first build over 2000 years ago – 3 times the size it is now and most impressive. Click here to read more about the Birdoswald Roman Trail on English Heritage’s website. Chesters and nearby sites offer a relaxing and tranquil section of Hadrian’s Wall country, located next to the North Tyne River and close to the market towns of Hexham and Corbridge. Probably one of the more elaborate areas of the wall, the Chesters Roman Trail is bursting with historic stories, monuments and remains and is one of the most interesting trails along Hadrian’s Wall. It’s not hard to understand why the Roman’s settled here, from bath houses to bridges, turrets to a Roman well and Roman engineering to admire, it made the perfect base just 6 miles from the market town of Hexham in a picture-perfect location. The Temple of Mithras was dedicated to the god itself, founded in the 3rd century this free historic site also contains facsimilies of altar stones found during excavations. Most interestingly was the discovery of Coventina’s Well. Discovered by a gentleman named John Clayton, who was a Newcastle-based lawyer, town clerk and antiquarian who lived at the nearby Chester’s estate, he arranged an excavation into the well, which produced over 13,000 coins, at least 22 altars, vases, incense burners, pearls and brooches. They were all gifts to the water goddess, Coventina, as the well is on the site of a spring. Some of these gifts are on display in the museum at Chesters Roman Fort. Most popular on the Chesters Roman Trail is Chesters Roman Fort, which is the best-preserved Roman cavalry fort in Britain. You can see what life would have been like 2,000 years ago at one of the Empire’s northern outposts. Explore the well-preserved baths and steam room or wander round the officer’s quarters, as well as discovering an amazing collection of Roman objects and inscriptions found here on the wall inside the Museum. John Clayton played a vital role in the preservation of the Roman Site’s around Hadrian’s Wall, due to his passion for archaeology. Chesters cavalry fort straddles the Wall and houses a garrison of 500 troops for around 300 years. Today, you can still see all 4 principa; gates, the headquarters building and the hall and regimental shrine. For more information on the Chesters Roman Trail, click here to visit the English Heritage website. This section of Hadrian’s Wall leaves the countryside and heads into Newcastle upon Tyne. The mix of remains in a rural and urban setting makes this eastern section of the Wall as fascinating heritage trail. Starting from Corbridge Roman Town – a beautifully preserved market town with traditional Roman high street – you head east towards the aptly named, ‘Heddon-on-the-Wall’, before exploring the Newcastle Suburbs of Denton and Benwell. Not all of the sites on Hadrian’s Wall were heavily guarded fortresses. Corbridge was a supply base and a bustling town, where the Romans and civilians would pick up food and provisions. Click HERE to read more about the pretty medieval town of Corbridge, or why not take a look at Orchard House Barn – a romantic bolthole set in stunning countryside just 2 miles from Corbridge, or The Drum Barn, The Hayloft or Old Woodworker’s Cottage to sleep 20 guests. 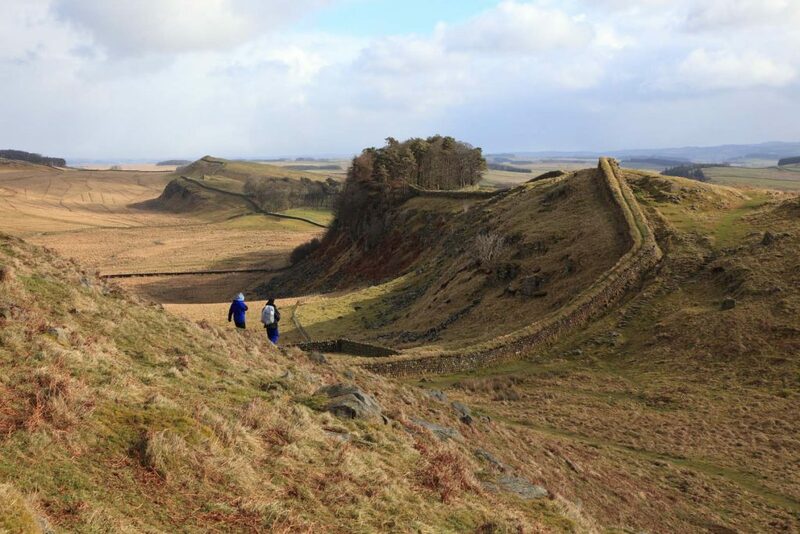 Hadrian’s Wall Path – National Trail is the long-distance footpath spanning 84 miles of glorious walking through rugged moorland, rolling fields and dynamic urban landscape. If 84 miles sounds a little daunting, then never fear, it’s positively encouraged not to walk the whole lot! Circular walks and shorter trails have been devised to cater for all abilities and take in many of the great sites and sights along the way. There’s even a baggage collection service. The attractions and museums along Hadrian’s Wall – the most magnificent and best preserved of Rome’s great frontiers, reveal the stories of Hadrian’s Wall with their own unique and compelling tales, illustrated with stunning objects set in the dramatic frontier landscape of Hadrian’s Wall Country. There is a part of Hadrian’s Wall Country for every visitor, from the stunning reconstructed Roman buildings, family friendly museums and dramatic cityscapes, through to the classic wild landscapes around Vindolanda and Housesteads, the inspiring and typical Roman forts, and the amazing seascapes and wildlife of the west coast. Hillwalk Tours have lots of information about Hadrian’s Wall, as well as being connected with the National Trails of England and with the Hadrian’s Wall Path Trail Officer in particular, so check out their website by clicking here for interesting information on walks around the area. They also have organised hikes lead by professionals, if you want to experience the best trails and views you can in this stunning area of our country. 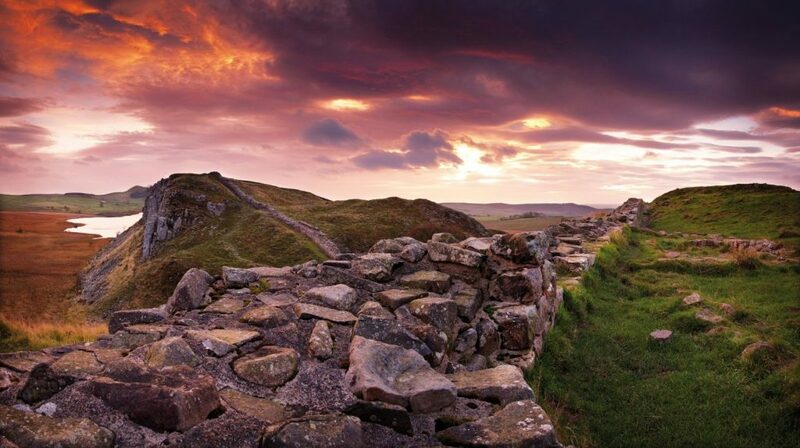 For almost 300 years Hadrian’s Wall was the north-west frontier of an empire that stretched east for over 2,500 miles to present-day Iraq and southwards for 1,500 miles to the Sahara desert. Built by the Roman army on the orders of the emperor Hadrian after his visit to Britain in AD 122, the Wall was manned by troops from across the Roman empire. It was only finally abandoned as a frontier in the early 5th centuary when Roman rule in Britain collapsed. But it’s history doesn’t end there, people have been studying Hadrian’s Wall for over 400 years. As first planned, the Wall consisted of a wall of stone or turf fronted by a wide and deep ditch. The original plan was for a guarded gate (milecastle) every mile, with two observation towers (turrets) in between. Before work was completed, 14 new forts were added together with an earthwork known as the Vallum to the south. Construction started in AD 122 and was largely completed in six years. Construction started in the east and proceeded westwards. The route chosen largely paralleled the nearby Stanegate road from Carlisle to Corbridge, upon which were situated a series of forts, including Vindolanda. The wall in its central and best-preserved section follows a hard, resistant igneous diabase rock escarpment, known as the Whin Sill. When the Wall was abandoned, it’s decaying remains served as a ready quarry for castles, churches and farms along its line. As a strong feature in the landscape, it was used to define parishes and estates. In time, it also attracted the attention of painters photographers, poets and novelists, as well as archaeologists and historians. It’s fame remains a draw for tourists from across the world. It even played a part in the world-famous TV series, Game of Thrones! The most complete and possibly most famous Roman fort in Britain, Housesteads is set high on an imposing ridge of Hadrian’s Wall. See what life was like 2,000 years ago for the 800 Roman soldiers based here. Stroll through dramatic remains of barracks, a hospital and some of the oldest latrines you may ever encounter. Make for Vindolanda to see the largest collection of excavated Roman buildings on Hadrian’s Wall. The only place on the Wall to see archaeologists uncovering Roman life before your eyes, Vindolanda is one of Europe’s most important Roman archeological sites. Be sure to explore Vindolanda museum and see the famous Vindolanda tablets, preserved Roman postcards from the past discovered in excavations here. Guarding the Roman Bridge ferrying Hadrian’s Wall across the River North Tyne is Chesters Roman Fort. Public bathhouses were an essential part of civilized Roman life and at Chesters you can see the remains of steam baths and dry heat baths – similar to modern day saunas. Visit the quirky museum here and see a range of finds discovered at Chesters, including a modius – a large bronze bucket used for measuring grain, dated to AD81. One of the Wall’s best-kept secrets, Great Chesters was built to guard the Caw Gap, the point where the Haltwhistle Burn crosses the Wall. The final Roman fort to be built, look out for its former strong room, a vaulted chamber at the centre of the grass-covered ramparts. See the only Roman alter still standing along the wall, which remains in place at the southern gateway. The foundation stone of strategic Roman campaigns throughout northern Britain, Corbridge was a lifeline supply base for legions garrisoned along the Wall. Wander the remains of buildings here, including granaries, a fountain house and a large courtyard building. Browse artefacts and finds found locally including coins, pottery and sculptures at the Corbridge Roman Town Museum. Meaning ‘strong fort’ Segedunum stood guard at the eastern end of the Wall. In its heyday, Segedunum housed 600 Roman soldiers and stood for almost 300 years as a symbol of Roman might against barbarian attack. See the only stone toilet seat from Roman Britain, spearheads and sections of ring mail armour as well as a collection of rounded throwing stones – once used as defensive missiles for the fort. Climb a 35-metre viewing tower for outstanding views across Segedunum.